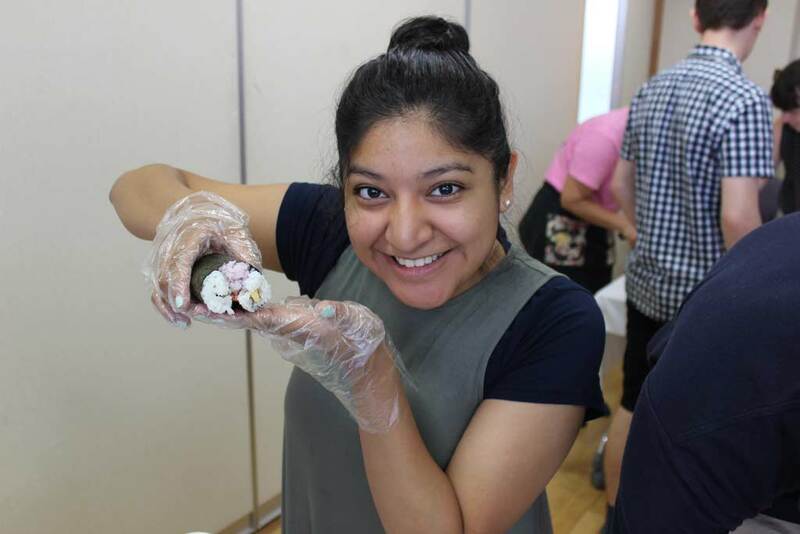 World Campus – Japan participants learns how to make various cute japanese food, like owl sushi. 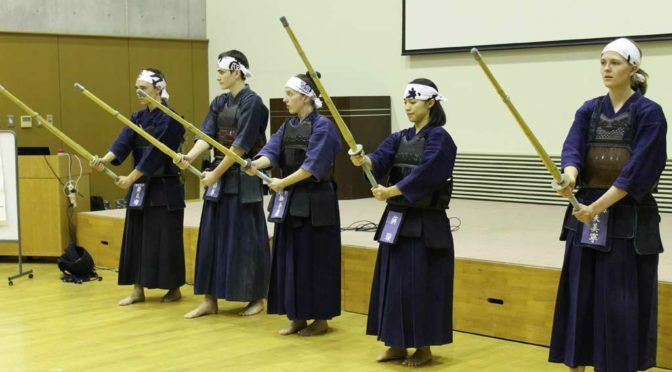 After that each participant gets to try various japanese dances and sports. 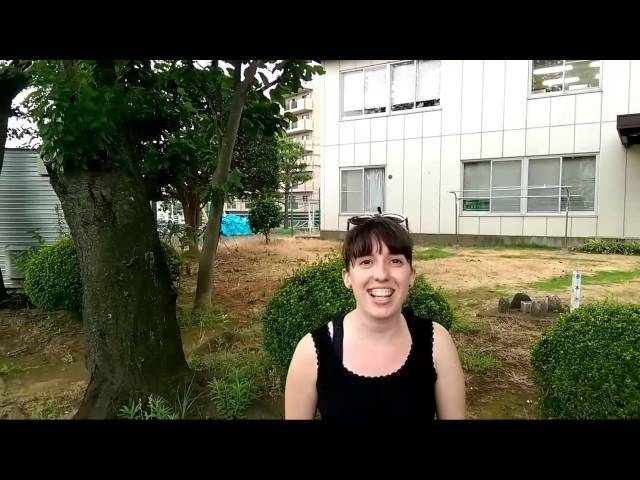 Stella talks about her experience with making food and learning Kendo. This was the day of our first Arigato Event for this session and for most of the participants. Although we trained really hard at the beginning of the week, it was still quite hard during the rehearsals. But before that we started with Hiro explaining us the theories of traveling to other countries and the culture shock and adaptations. I found this to be very interesting. After that we first walked through the program of the Arigato Event. What would happen, where do I stand, how much noise I’m supposed to make, etc. Also, after lunch we spent a lot of time rehearsing this together with our performances. Near the end of the rehearsals everyone spent some time on practicing their weak points or helping others with theirs. Our performances as a group consisted of 2 songs, one of which we sang multi-lingually, a trivia and a word quiz – in which every country had two questions on both subjects and the audience has to guess, or know, the right answer – and a dance medley consisting of four shortened versions of famous Japanese songs, one of them being girls only and the other one a boys only dance. Other than that, some people also did something extra, like a cultural performance. Before the official Arigato Event started we demonstrated what we learned on Tuesday with the Japanese cultural experience activity. The audience really seemed to enjoy it and the Arigato Event as well, even though it continued ‘till past 8 o’clock. Their enjoyment made me really happy and made all the hard work of last week really feel like it was worth the effort. Bonus Story: After lunch we had free time. Previously we were told to not leave the building or the area, at least during small breaks, by one of the counselors. During the break when I was with a few other people on the parking lot catching ‘em all we saw that counselor and some others go to the konbini. We decided to follow and buy some ice cream, but when we came back, right on time, it turned out we were not actually supposed to do that. But considering it was a misunderstanding and everyone was back on time, it turned out okay and no permanent harm was done. You shouldn’t follow our example though. Today was an interesting day here in Toride, as the WCI group were to explore some old established stores, hear about their interesting trade and then make some PR material for them. In the morning we started out as usual with our morning meeting, where we were quickly briefed about the stores. Then we took off into the burning morning sun. Although it was a short walk to the first store, there was still need for sunscreen and hats. The first shop we went to was Shinroku’s Narazuke shop. Narazuke are traditional Japanese pickles made from fruits and vegetables and only with natural ingredients. The process includes the fresh vegetables and fruits being pickled with sake lees, which is a by-product from sake production, salt and sugar. This procedure was shown to us at the factory, which was extremely interesting. We also got to pray to the god who protects the production and shop at a small shrine in the backyard. To top everything off, we went back in to have some taste tests of pickled ginger, white melon and eggplant. The reaction was varied amongst the participants, but personally I found it quite nice, even though I would prefer it as part of a meal. 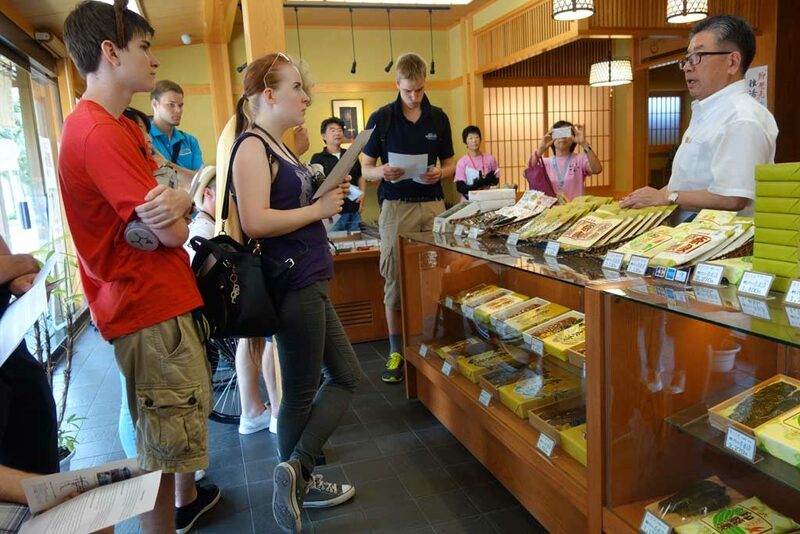 After the visit at the pickle shop, we went to a shop specialized in making traditional items for festivals. The whole store was filled with traditional paper lanterns, fans and handmade dolls. The owner and maker of the dolls and lanterns showed us different videos of the process of making said things. It was very interesting to see, as we don’t have anything quite like that back in Denmark. We also took a group photo that was later put on fans and given to us as a present from the owner. After the visit to the shops, we went back to have lunch, which today was Japanese curry with fried pork cutlet. 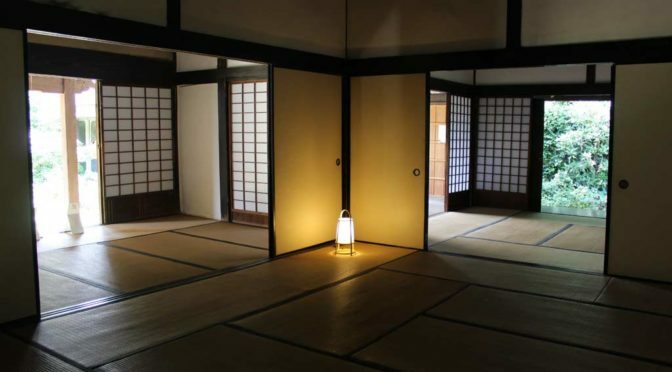 When everyone was done eating, we proceeded to the next event of the day, which was to visit an old, well-preserved house in Toride. The house was about 200 years old and looks almost exactly as it did back then. We had a guided tour around the building and were surprised to hear that not a single nail had been used in the making of the house. All the beams and pillars that support the house had instead been carved to fit into each other like a giant jigsaw puzzle. This was but one of the many unusual and interesting facts we were told about the building. The last scheduled event of the day was making of PR material for the shops we visited earlier and the old house. We were divided into three groups, where my own group was in charge of the pickle shop. All groups where then given paper to make a pamphlet. We decided on a design that included both history of the shop, the process of making pickles and our own testimonials. As mascots, Stella from Greece drew some happy vegetables and fruits dancing around in sake lees, salt and sugar. It all came out nicely, if I should say so myself. All in all it was another great and eventful day here in Toride. 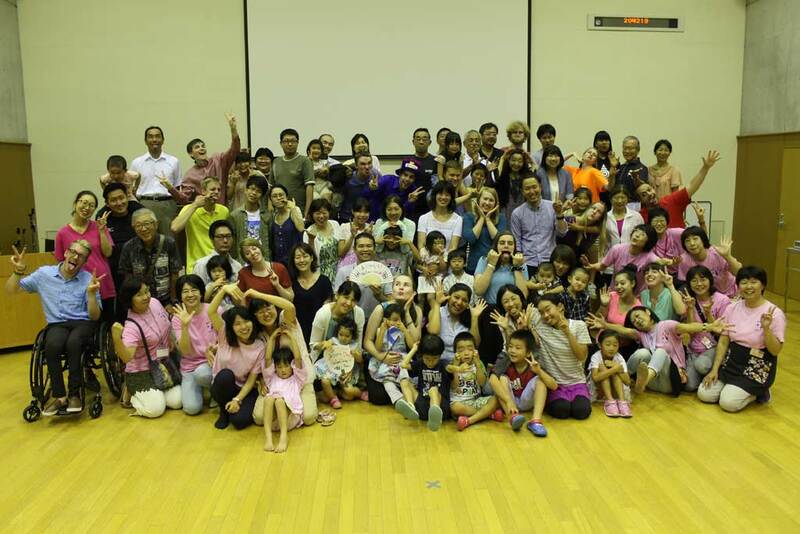 Today Sabine and the rest of the World Campus – Japan session 3 participants make kites with their host families. 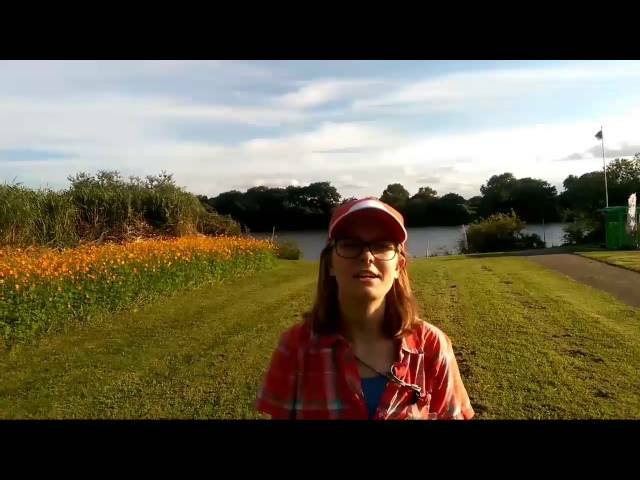 Sabine talks about her experience for the day. Today we got to make our own lunch and although it may sound average, it wasn’t. I studied Baking and Pastry and have made several cute items, but something about Japanese lunches is just absolutely unique. We made Inari onigiris in the shape of an owl. We also got to try making sushi that once we cut the sushi you’d see an owl’s face. It was the cutest lunch, I almost felt guilty eating it. After lunch we got to experience Japanese culture in various groups. I got to learn how to play the Koto, which is a traditional instrument meant to look like a dragon. We were taught how to play a traditional song. It was amazing to say the least.